After visiting on a mission trip in the spring of 2017, Carson felt a calling for the Audience of One Foundation to establish a footprint in Haiti. He saw the great work Mission of Hope (MOH): Haiti had already been doing in the country, and together they began “A partnership to bring hope to a nation through sport” by building the Haiti Sports Complex. Only a few months after Carson’s initial visit, the AO1 Foundation granted MOH: Haiti the funds to complete Phase I of the project, which includes a multipurpose building complete with locker rooms, bathrooms, showers, two basketball courts, and a sport court. With Phase I nearing completion, construction of Phase II is expected to begin shortly, which includes the addition of turf fields adjacent to the multipurpose building. Through the partnership with MOH: Haiti, the AO1 Foundation will continue to help fund, maintain, and run the Haiti Sports Complex. What are the conditions like in Haiti? The harsh reality in Haiti is that over 98% of people will not graduate high school, over 80% of people are unemployed, and over 54% of people live in poverty. However, we believe the root cause of these issues is a lack of opportunities, limited focus on education, and a lack of understanding of identity. What separated Mission of Hope: Haiti from other organizations? Mission of Hope: Haiti provides over 91,000 meals per day, education for over 9,000 people per day, and is restoring villages from the inside out both physically and spiritually on a daily basis. Why build a sports complex? We believe that sports create an opportunity for people to develop physical abilities, foster teamwork, learn interpersonal skills, cope with stress, and grow in responsibility to become men and women of integrity. Sports has the capacity to mobilize and inspire people from different cultures and backgrounds. By impacting over 15,000 children per year, the Haiti Sports Complex will provide the opportunity for children to develop those positive character traits and life values. The ultimate goal of the Haiti Sports Complex is for the people of Haiti to receive Jesus Christ as their Lord and Savior. Every North American and Haitian worker at the complex will be trained to include aspects of the Gospel when interacting with children. Through these interactions with mentors and older role models, we believe the people of Haiti will begin to change the way they view the world around them. These coaches will be readily available to dig deeper in the Word and to help guide families to a local church. Has Carson returned to Haiti since his first mission trip? 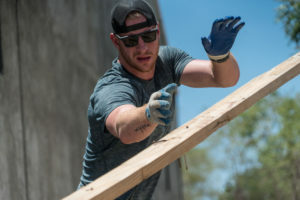 Yes, Carson returned to Haiti with several of his Eagles teammates in 2018. He plans to visit the country frequently, as it holds a special place in his heart. How can I contribute to the work being done in Haiti? Currently, the best way to contribute to the work being done in Haiti is through monetary donations. Please utilize the “Donate” button at the top of our website to accomplish this. For any other inquiries, please contact us at: info@ao1foundation.org.